Fire up the grill and get ready for a no-fuss, no-mess dinner made in 30 minutes! 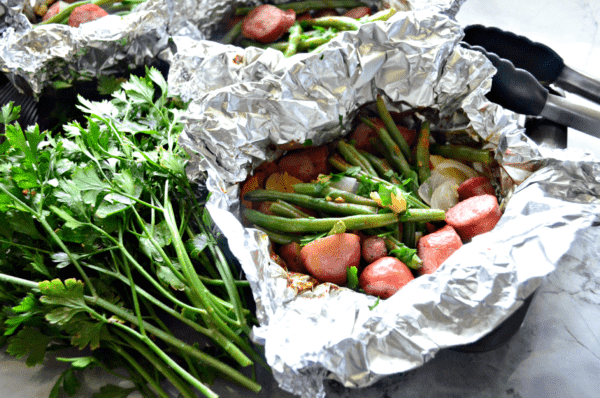 Enjoy this delicious and easy recipe for Grilled Kielbasa & Potato Foil Packets. We are in the heart of summer and it’s hot! The days are long and the kids are home from school. In my case, my son is home all day every day and wanting to see friends and do fun things daily. By the time dinner rolls around I’m exhausted. I need no-fuss low energy exerting dinners. 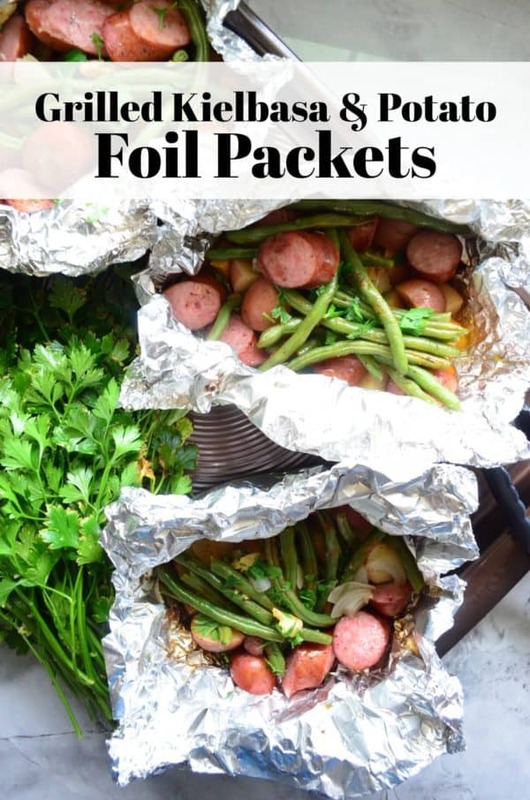 Enter this quick (done from start to finish in 30 minutes) and easy recipe for grilled kielbasa and potato foil packets. Chocked full of fresh kielbasa (a family favorite in my home), freshly sliced potatoes, bell peppers, onions, and green beans. It’s a full dinner in one packet! Perfect for a quick weeknight dinner or even entertaining. If your making this recipe for a large group just double (or triple) the recipe! You could even prep the veggies ahead of time to cut down even more of the prep time. The key to the meal cooking quickly is evenly cut vegetables and sausage. Keep that in mind when prepping this dinner. I only use a 12×12 piece of aluminum foil per packet. As I chop, I place the ingredients on top of each of the sheets of foil. Once all the ingredients are piled in the middle, I sprinkle on the Cajun seasoning, salt and olive oil, and a pat of butter for good measure. Then I gather the two ends of the aluminum foil up to the sky to form what I call a taco. I fold the two ends in like a burrito and then start to roll down and crimp the top tight. The goal is to keep all the steam and heat in the foil packets so that they cook quickly. I transfer the packets from the kitchen to the grill using a sheet pan. I also keep the sheet pan at the grill, so when the time comes to remove them you can just place it on the sheet pan. Of course you can’t pick these hot packets up with your hands. You’ll need a long pair of tongs to carefully remove them off the grill! So if your looking for an easy summer time recipe to cook, give my recipe for grilled kielbasa and potato foil packets a try. Preheat the grill to 500 degrees. Place 4 12x12 pieces of aluminum foil on the counter. 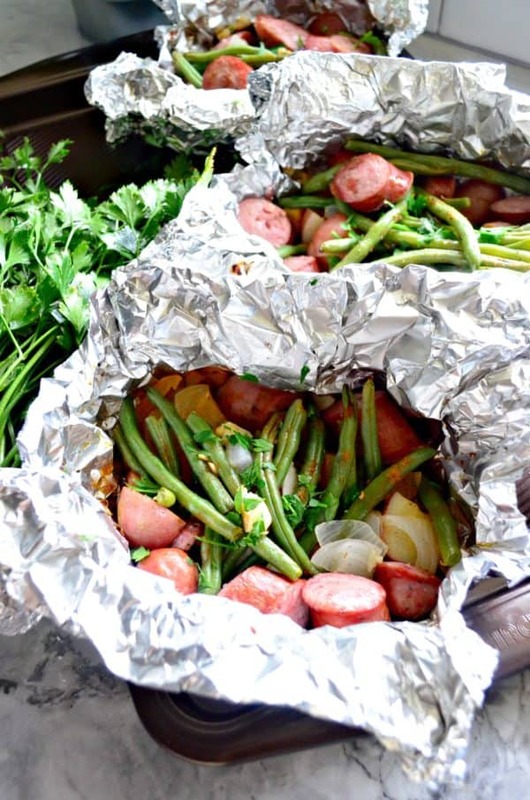 Begin to layer and divide the kielbasa, potatoes, onion, bell pepper, green beans, and garlic in the center of the aluminum foil. Then place 1 tablespoon of salted butter in each foil pack. Season each foil packet with Cajun seasoning and salt (optional). Drizzle on the olive oil one by one and begin to close the packets. Fold in half and then gather each side up toward the sky, crinkle and close until sealed tight. You do not want any air (steam once cooking) or juice to escape. Place the foil packets on the grill and grill for 20 minutes until potatoes are tender. Carefully remove foil packets from grill. Place each packet on a plate. Carefully open the foil packets and sprinkle with freshly chopped parsley on-top. Enjoy immediately.